London/UK — Andy Murray writes tennis history for Britain as he won the HEAD-to-HEAD final at the All England Club in Wimbledon. With a 6-4, 7-5, 6-4 victory over fellow HEAD player Novak Djokovic, Murray became the first British player in 77 years to win the Wimbledon men’s singles trophy. The final between the world’s top two players was tension-charged, with Djokovic saving three consecutive match points and Murray salvaging three break points in the last game. 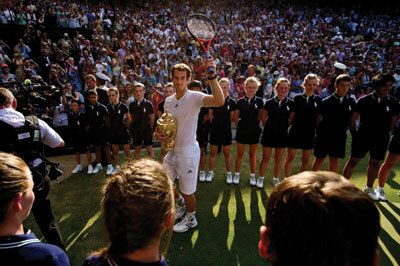 The Scot, playing with his HEAD YouTek™ IG Radical, finally dropped to his knees after winning his second Grand Slam. “To win today was unbelievable! We played such a tough match with so many long games. I don’t know how I came through the final game after those three match points. I’m just so glad to win,” said the Scot. In the men’s doubles competition HEAD Racquet Rebel Ivan Dodig (HEAD YouTek™ IG Radical) reached the final with his partner Marcelo Melo. The team from Croatia and Brazil lost 6-3, 3-6, 4-6, 4-6 to the Bryan brothers from the United States. In the women’s doubles final, three of the four racquets on court were HEAD. China’s Shuai Peng swung her HEAD YouTek™ IG Extreme to a win alongside Hsieh Su-Wei as the Asian defeated the Australian HEAD team of Ashleigh Barty (HEAD YouTek™ Graphene™ Speed) and Casey Dellacqua (HEAD YouTek™ IG Radical) 7-6(1), 6-1. 17-year old Barty and Dellacqua were playing their second Grand Slam final of the season.